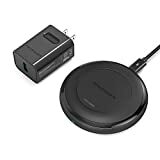 Ever since the RAVPower HyperAir Fast Wireless Charger was first released for $60 last year, it’s been our favorite wireless charger. It supports 7.5W fast wireless charging and 10W fast wireless charging, so every iPhone and Android phone model is covered. It’s also made of aluminum instead of cheap plastic like other models, and there’s a rubbery ring on top to keep phones from sliding around. Also, it’s not just the charger itself that’s better than rivals, it comes with a high-quality braided power cord to ensure it’ll last. The HyperAir has dropped from $60 to $30 on Amazon, making it a no-brainer. But if you use the coupon code ZSNPQ9HJ at checkout, you’ll only pay $19.99!